ST. TAMMANY PARISH- The Louisiana Department of Transportation and Development wants to remind motorists that a significant traffic configuration has been implemented on LA 59 at Sharp Road in Mandeville. The traffic switch places motorists off of LA 59 onto a temporary detour road that provides access back onto Sharp Road. The configuration begins approximately 300 feet before the intersection. This new configuration was required in order to begin construction of the new roundabout that will be placed at this intersection. 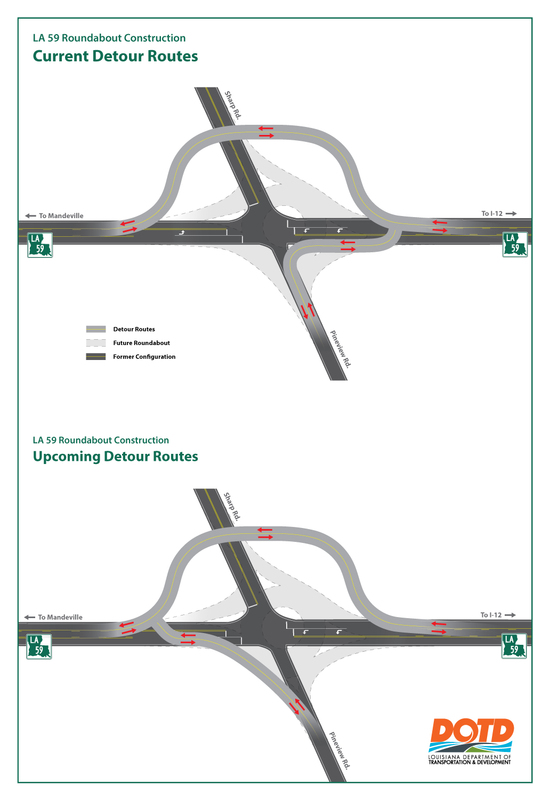 This configuration, which was put into place on Jan. 24, is expected to last roughly three months until the roundabout is constructed to allow thru traffic to enter. Construction crews are diligently working along the intersection of LA 59 and Sharp Road. Bypassing the detour route and entering into the work zone is dangerous for not only workers, but motorists as well. The $2.04 million project was awarded to Command Construction Industries and is estimated to be completed early summer 2019. All construction activity is weather dependent and may be rescheduled in the event of inclement weather. DOTD appreciates the motoring public’s patience and reminds drivers to please exercise caution when traveling through work zone areas and be on the lookout for work crews and their equipment.